According to a recent Wall Street Journal article, job hopping is on the rise and that may not be a bad thing. In fact, for the right reasons it could be good. Very good. Or it could be bad...very bad. Figuring out the difference is essential when recruiting passive candidates. This post will walk you through how to determine the good vs. the bad and how to turn what you’ve learned into a recruiting advantage. To start this assessment, during the work history review, I like to ask candidates why they change jobs and if the moves were successful. And, what I’ve discovered is that most people take jobs for the wrong reasons. As a result, the job rarely delivers on the promise, and they end up moving on. 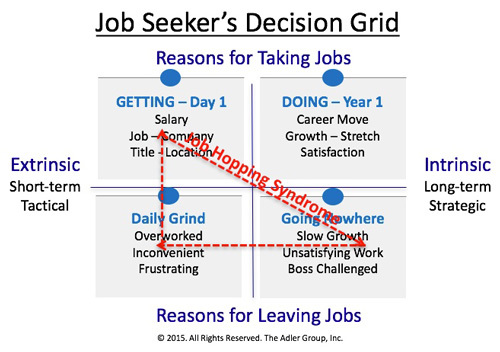 This dilemma is shown on the Job Seeker’s Decision Grid graphic. The result is Job Hopping Syndrome. It turns out that most people leave jobs for one of the two reasons on the bottom half of the graphic. The Daily Grind box in the lower left of the grid represents all of the short-term extrinsic frustrations of the positions. The Going Nowhere box in the lower right represents a career that has stalled – these are the long-term intrinsic reasons. A pattern of taking jobs for the short-term benefits jumps out during the work history review. Once revealed, it offers a great way for a recruiter to intervene if the job being represented offers a true career move. Here are some ideas on how to use the grid to help persuade a candidate to job hop while making the right career decision. When asking the “why left – why accepted” questions be most concerned if the candidate has a pattern of leaving jobs for short-term reasons. People leaving jobs for long-term reasons is okay unless they stay too long. Regardless, just pointing this out using the decision grid will often get a serious-minded candidate to rethink how he/she makes career decisions. The point is to suggest that a career strategy emphasizing the long-term factors is better than emphasizing the compensation or the other short-term factors. 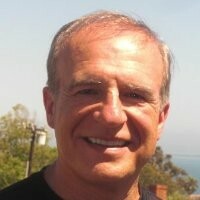 Define a career move as a 30% non-monetary increase. I tell candidates a career move needs to offer a combined 30% increase over the person’s current job in terms of job stretch (bigger job), job growth (rate of increase), impact (bigger) and satisfaction (a mix of more exciting work). I then suggest we use the first discussion to determine if the open position offers this type of career opportunity. Conduct a performance-based interview to determine if there is a 30% opportunity gap available in the open position. This involves describing each major performance objective defining job success and asking candidates to describe in detail something he/she has accomplished that’s most comparable. If the opportunity for growth exists the factors comprising the 30% increase will stand out. During the negotiating phase I ask candidates to compare their current job opportunities on a Day 1, Year 1 and long-term perspective. I often send an email outlining the factors in each category and also ask them to rank the factors in order of importance. Since most recruiters and hiring managers generalize the mid- and long-term opportunities it’s easy to demonstrate that the long-term factors are what drive career success and that my open opportunity is the superior job. Close the deal by putting the money in the parking lot. Before the final close I ask candidates to ignore the compensation and describe why my job represents the best career opportunity. If the assessment and recruiting process has been conducted properly the candidate describes the 30% increase in his or her own words. If the candidate doesn’t or can’t do this, it’s unlikely the person will accept your offer. The bigger point of this approach is to ensure candidates change jobs for the right reasons. Too often, in the rush to close, the long-term consequences of bad hiring decisions are ignored. Diagramming a candidate’s past decision-making using the Job Seeker’s Decision Grid will allow the person to make the correct decisions in the future. More times than not, the correct decision will be accepting your offer.